Perfect on a cold winter night, this dish is the ultimate comfort food. The chipotle peppers in adobo sauce give it a nice southwestern flair that reminds you of being in the south… for me that’s Texas! The chipotle peppers turn up the heat in this dish, combined with the tender chicken, melting cheese, and fresh tomatoes and herbs. 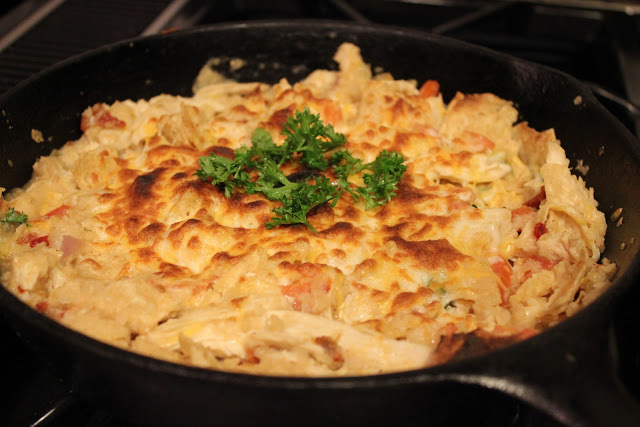 Unlike some southwestern-inspired casseroles that call for cans upon cans of that sodium-engulfed cream of chicken or cream of mushroom soup, this casserole was light, relatively healthy, and comforting all at the same time. Cooking doesn’t have to be hard, especially when you only need one skillet to do so! This casserole was just as good as it looked. Enjoy! Saute onion, garlic, chipotle peppers. Stir in chicken broth. Simmer and add chicken and tortilla chips. Cook for 10-15 minutes. 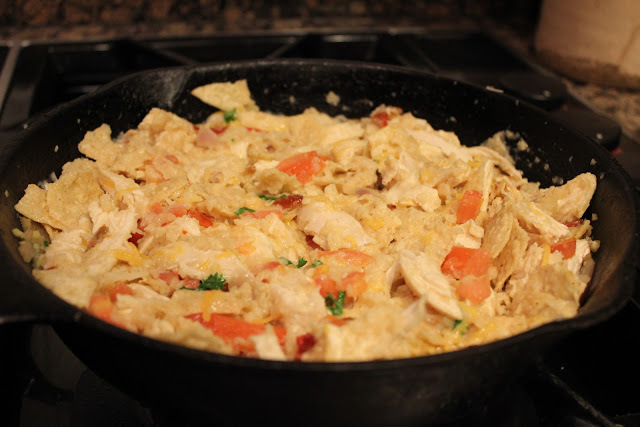 Shred your chicken then add it back to the pan, along with the diced tomato, parsley, cheese and remaining tortilla chips. Sprinkle with cheese. 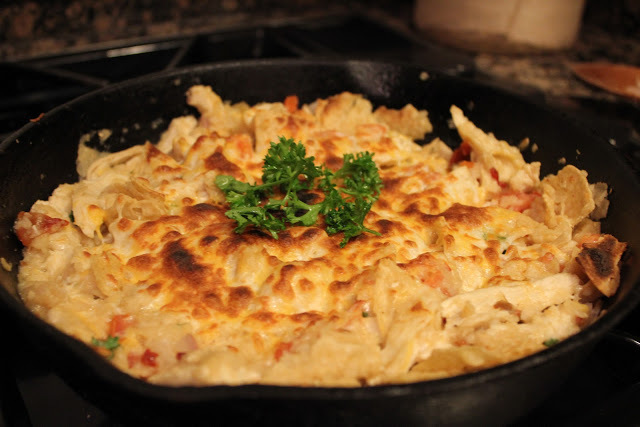 Place under broiler for 2 minutes or until cheese is melted and browned on top. 1. Add oil to a 10-inch oven-safe skillet and set over medium-high heat. When the oil shimmers, add the chicken breasts and brown well on both sides, about 6-7 minutes total (the chicken won’t be cooked through yet). Remove the chicken to a plate and tent to keep warm. 2. Add the onion, garlic, and chipotle peppers to the pan and cook until just fragrant, about 1 minute. Stir in 1 3/4 cups of chicken broth, scraping the bottom of the pan to release any browned bits. 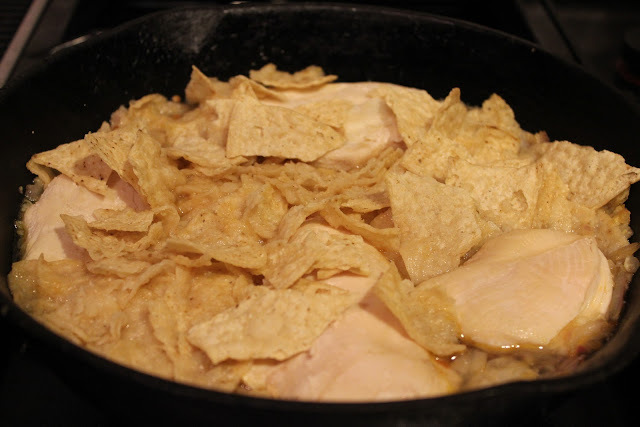 Bring the mixture to a simmer, then mix in half the tortilla chips. 3. Reduce the heat to medium and nestle the chicken into the pan. Cook for 10-15 minutes, or until the chicken is cooked through (160-165 degrees F on an instant read thermometer). Remove the chicken to a plate and allow it to cool slightly. When you can handle it, shred into bite-sized pieces. 4. Preheat your broiler and place an oven rack about 6 inches from it. 5. Add the shredded chicken, tomato, 1/2 cup of the cheese and 1 tablespoon of the parsley to the skillet, stirring to incorporate (if the mixture seems a little dry, stir in the remaining 1/4 cup chicken broth). Add the remaining tortilla chips and gently mix to combine. 6. Sprinkle the remaining cheese over the top of the casserole and place under the broiler for about 2-3 minutes, or until the cheese has melted and browned. Remove and let cool for 5 minutes then garnish with the remaining parsley and serve.